First Video on Instagram, now the world! Or so it seems are the photography-focused social media site's intentions as today Instagram announced that users can now embed snaps and videos taken through its filtered lenses across the web. When an Instagrammer jumps on through the desktop, a new share button will appear on the right of the photo or video they're checking out. 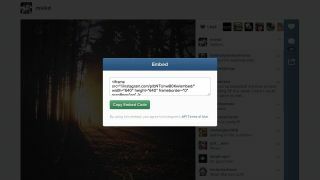 A click will pop up an embed code, ready to paste on a blog, website or article that supports HTML. Codes will only show for public videos and photos, Instagram pointed out, and users' handles will appear with the content they post. Say "cheese!" Now, say "Blips!"